I needed a vintage cotton tablecloth, plain and aged, for a very exciting shoot last night - so went a trawling my favourite antiques and collectables shops. No cloths but I did not come away empty handed, I never do, a fact pointed out to me by the proprietor of ECLECTIC (with a chuckle). 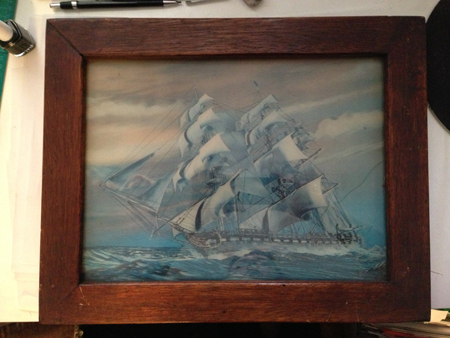 I scored this fabulous framed lenticular ship and a glass flower frog for my collection. Winner me! As it is against my nature to fail at a task, I bought a plain white cotton tablecloth from Mr P and hand dyed it with rooibos tea, instant coffee and a swig of vanilla extract. It came out perfect.